Last week was a productive one. I did quite a bit of machine sewing. Just a wee bit of the hand sewing project I introduced you to last week. Hope to have that block done for next Tuesday. I spent quite a bit of time working on the Dutch 9 Patch blocks, one of which is shown on the left. In fact, I finished 14 of them and already had a few done. In the second picture you can see that I have grouped them in 4s. I plan to sew them together in 4s and then put sashing and corner stones. Not sure of the size yet. The intent is that this will be a wedding quilt for a nephew in a few years. The block finishes at 9inches. This is a good scrap project. 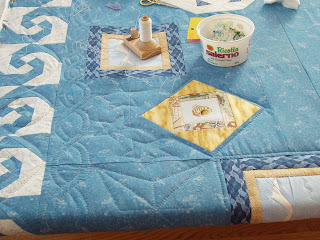 I am not repeating any fabric in a second block. As I work on other projects, I cut pieces for this and then sew when i have a bunch ready to go. Did some good work on the Nautical quilt. I'm at the top left corner now. There are a bunch of stars to be quilted in the background. I like doing them as they fill in a good sized area. I don't know if you can tell from the photo, but the middle of the square with the yellow triangles is a cross-stitched shell. My sister did a few cross-stitches for this quilt. They are done on some sort of Aida cloth and then I backed them with a very fine cotton so that the batting wouldn't beard through over time. These are being quilted with the 'stab' method, straight down through one hole and then straight back up through the next. Rather slow but it does look good when done. 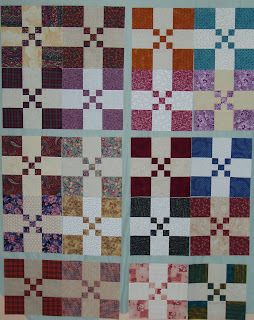 I love the Dutch nine-patch block...this is a new 9-patch interpretation for me...your blocks look great. 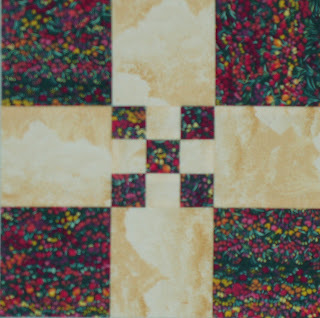 Your quilt blocks are beautiful! I love that blue one your working on, with the pretty yellow cross stitch block, that is stunning! Thanks for stopping by my place. Have a great evening! !